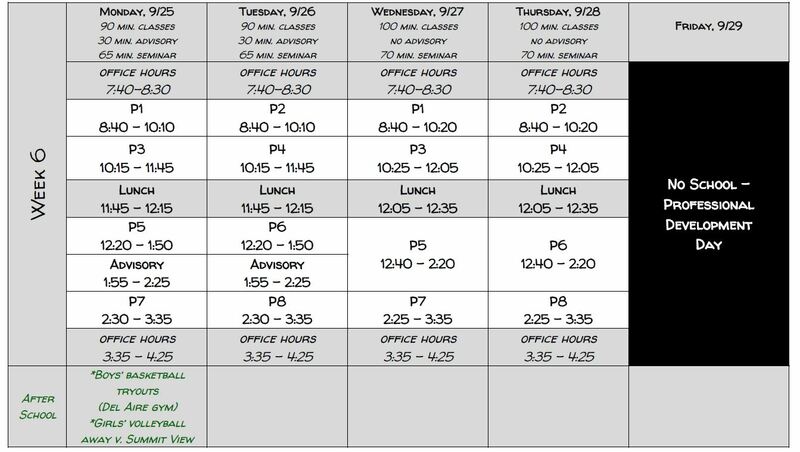 Update: the make-up day for student photos will be Thursday, October 5th. The password to access each gallery is the Advisor name – ie, if their advisor’s last name is “Wallis”, then go to the folder called “Wallis” and use “Wallis” as the password to view and purchase the photos. Stacee credits a part of every photo purchase back to DVS, so if you buy your students’ photos you are also supporting DVS! Thank you!! 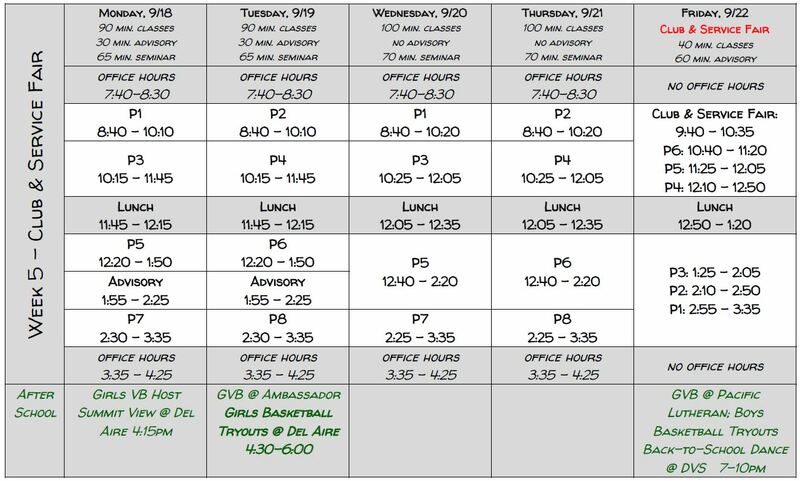 Boys basketball tryouts continue after school on Monday in the Del Aire gym. In advisory next week, we will begin our unit on “understanding differences” and begin the important and difficult discussions about race, culture, religion, diversity & equality that are so important to our DVS family (and our country!). I encourage you talk ask your kids about what they learned and shared in these discussions! Da Vinci is once again offering an ACT/SAT Prep course to its students through PJ Test Prep, a small Test Prep and Tutoring company based in the south bay. They have been in business since 2005 and have been offering SAT/ACT prep with Da Vinci for 3 yerars and they do a great job! The course, open to all students from all DV high schools, will be 5 days over winter break from Monday January 7th to Friday January 11th, 2.5 hours per day. Students can sign up for either the AM session (10:00-12:30) or the PM session (1:15-3:45) and are expected to attend the same session for all 5 days. The course costs only $50 per student. Partial scholarships are available, so please don’t let the cost stop you from signing up! 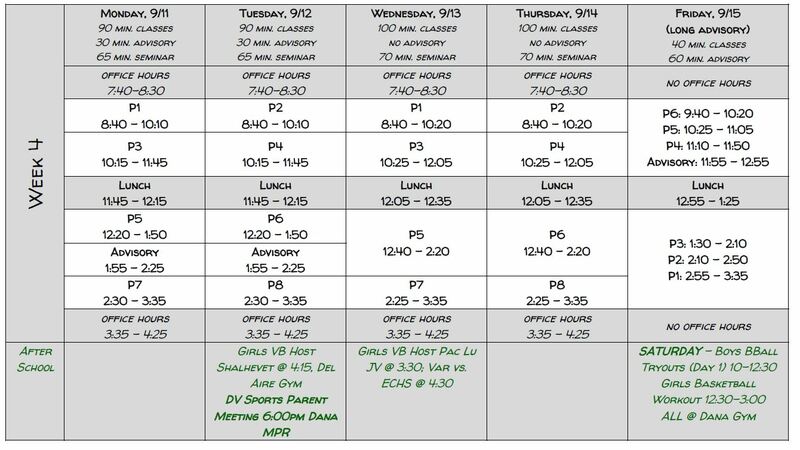 Here’s the schedule for next week. We encourage all students to be coming to their teachers’ office hours to get help and feedback on their work! the team store, and more. The meeting is not mandatory, yet it will answer many of the questions we have received over the summer, and have you prepared for what to expect as your children begin their high school sports journey. The College Counseling team is excited to meet individually with each senior family to discuss your student’s Post-DVS plans. Please make an appointment with your college counselor according to your student’s last name. Thank you for attending Back-to-School Night! Hi Families! We hope to see all of you at Back to School Night tonight! Just a reminder that it starts at 6pm and it’s for all grade levels. On Wednesday and Thursday, students will be getting their pictures taken here at school. The students will get their picture taken during their English class, so if they have English on Wednesday (periods 1, 3, and 5), they will get their photo taken then. If they have English on Thursday (periods 2, 4, and 6), they will take their photo on Thursday. Our new Da Vinci website has launched at www.davincischools.org!! Check it out!! There are many new features suggested by Da Vinci families, staff, and other key stakeholders. One of the features we are most excited about is our new online event calendars that bring all Da Vinci and Wiseburn school calendars, as well as athletics and arts, into one central location. You can view and filter calendars, subscribe to them, add them to your personal calendar, forward to friends and family, and be notified of changes when they occur via text and/or email. Check out the Event Calendars here: http://www.davincischools.org/events/. We invite you to explore our new website and let us know how we’re doing by emailing info@davincischools.org.